I’m having a blast with this Looneyspoons cookbook my friend let me borrow. I won’t see her until Friday to give it back to her, and hopefully by then my copy I ordered on Amazon will have arrived, I can’t wait. I have several other recipes I’ve made from this cookbook that I will be sharing soon. 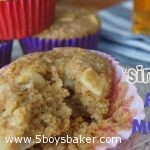 These “sinnamon apple muffins” were so, so good! They were delicious on their own, but then we threw a little butter and some homemade strawberry jam on them and oh my, they were absolutely dee-lish-ous!! They are so moist and I loved the little chunks of apples in them. They would be great for breakfast, lunch or dinner. We loved them. Preheat oven to 350º. Spray or line a 12-cup muffin tin. Pour boiling water over oats in a medium bowl. Stir and let sit for 20 minutes. Combine both flours, sugar, baking powder, baking soda, cinnamon and salt in a large bowl. Set aside. In a small bowl, whisk together honey, applesauce, egg, butter and vanilla. Add applesauce mixture to oats and stir until smooth. Add oat mixture to flour mixture and stir until dry ingredients are moistened. Fold in chopped apples. Divide batter among muffin tins. Sprinkle each muffin with cinnamon & sugar. Bake for 20 minutes or until toothpick inserted scones out clean. The recipe says to divide the batter among 12 muffin tins, I filled them almost completely full and ended up making 16 muffins. Also, if don't care for chunks of apples in your muffins, you could easily grate your apples instead. Yummy! Love a healthy muffin! I made these for a neighbor and of course for us! Thumbs up all the way around! Thanks Christine! I haven’t made these forever, thanks for the reminder of how good they are.